Murder mystery Aberdeen events are a fun way to spend an evening. Most murder mystery nights are held at hotels and are preceded by a meal and coffee that is usually included in the price. The hotels often offer discounted overnight accommodation and full Scottish breakfast for each guest. This is recommended for those who enjoy a drink or want to stay late into the night solving the case. 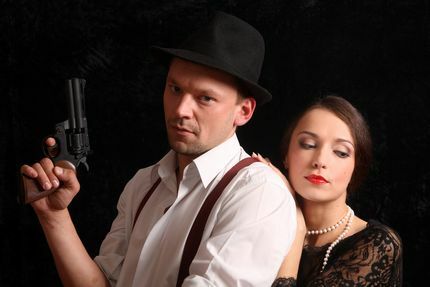 The price of the murder mystery evening usually includes actors to stage the villainous deed and host the investigation, a memento of the murder mystery party such as a certificate and a prize for the amateur detective who solves it. Deerstalkers and magnifying glasses are optional! So if you fancy yourself as a Miss Marple, Poirot or Sherlock Holmes then this is for you. Below are companies and hotels that often host a murder mystery weekend or night. If you are running or hosting a murder mystery night and would like free advertising on this page then please contact us. On the 14th April 2018 a murder mystery dinner, called Stage to Scream, in aid of CLAN Cancer Support, takes place at The Tufted Duck Hotel at St Combs. Tel 01346 582481. For more information about murder mystery games in Aberdeenshire visit the Blitz Entertainment website at www.blitzentertainment.co.uk where they organise and provide scripts and actors for many of the local events.